Kimi Raikkonen got his title defence back on track with a dominant victory for Scuderia Ferrari in the Malaysian Grand Prix. The world champion had a frustrating race last weekend in Melbourne, with two driving errors at turn 3 followed by an engine failure. Making up for that disappointment, the Iceman drove a perfect race here in Sepang beating Robert Kubica’s BMW Sauber and Heikki Kovalainen in the McLaren. The manner in which Kimi Raikkonen dominated the Malaysian Grand Prix means Ferrari has finally reveal the true pace of the F2008. Though the performance from the blue and white cars (BMW Sauber) could suggest that this championship battle may be a three-way fight. Kubica’s second place finish follows on from team-mate Nick Heidfeld’s impressive result in Australia. 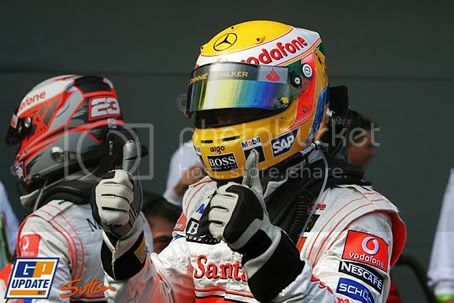 Both drivers have now finished in second position in two consecutive races. In addition, this was the Pole’s first podium since the 2006 Italian Grand Prix. Sure, Kubica benefited from Felipe Massa’s spin on lap 31 to take the runner-up spot, but the German team do have genuine pace to keep up with the top two teams in Formula One. It will be a matter of when BMW scores its first victory this season. In Melbourne at the first corner, Massa lost the back end of his car in a bid to out-accelerate Heikki Kovalainen. This resulted him to hit the tyre wall but he was fortunate enough to get away with only a damaged front wing. Finishing in fourth went to Toyota’s Jarno Trulli who managed to resist a late race charge from Lewis Hamilton. Nick Heidfeld was sixth while Mark Webber scored two points for Red Bull Racing after the team started the weekend poorly. Close behind Webber was Fernando Alonso, who scored the final remaining point. He finished six seconds ahead of the second Red Bull of David Coulthard, with Jenson Button rounding out the top ten in the Honda. Despite the poor race for Lewis Hamilton, the Brit retains the drivers’ championship lead with 14 points but following Raikkonen’s commanding victory here in Sepang, the Iceman is only three points behind. In the constructors’ chase, McLaren Mercedes leads with 24, ahead of BMW Sauber on 19 and Ferrari on 11. NEXT ROUND: Bahrain Grand Prix, Bahrain International Circuit. April 6. After the disappointment of Melbourne, Ferrari strikes back with a commanding performance in qualifying in Sepang, with Felipe Massa taking his second consecutive pole position. The Brazilian lapped the Malaysian circuit with a time of one minute, 35.748 seconds, half a second quicker than his Ferrari team-mate Kimi Raikkonen. The margin between the pair suggest Massa is running light… No matter, the red cars were comfortably faster than the McLaren pair of Heikki Kovalainen and Australian Grand Prix winner Lewis Hamilton. How did this happen? After completing their laps in Q3, both Heikki and Lewis started to save fuel by touring around the track at a reduced pace… on the racing line! This meant that faster drivers such as BMW Sauber’s Nick Heidfeld and Renault’s Fernando Alonso had to dodge through the field. This was unsporting and dangerous. The race stewards made the right call with McLaren accepting the punishment. With the silver cars push down to eighth and ninth (Kovalainen and Hamilton respectively), the top ten of the grid move up two positions. Jarno Trulli – who was fastest of all in Q1 – is promoted to third for Toyota. Alongside the renowned qualifying expert is Robert Kubica in the BMW Sauber followed by team-mate Nick Heidfeld. Mark Webber lines up in an impressive sixth for Red Bull Racing with double world champion Fernando Alonso in seventh for Renault. Completing the top ten is Timo Glock in the second Toyota, just edging out Honda’s Jenson Button. After the highs of Melbourne, Williams’ Nico Rosberg was frustrated by his qualifying pace and could do no better than P16. That is much better than his team-mate Kazuki Nakajima, who will start at the back following his ten-place grid penalty after crashing into Kubica last weekend… As for Nelson Piquet, the Renault driver seemed to be more comfortable here compare to Melbourne. 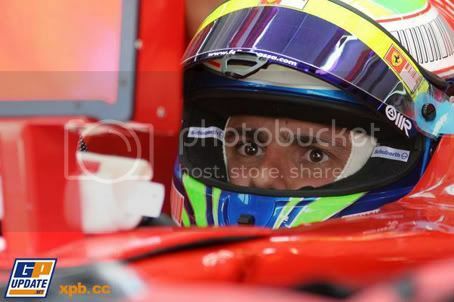 The Brazilian was unlucky not to out-pace his team-mate Alonso and will line up in P13. With the Ferraris up front and the McLarens down in the mid-field, Sunday’s Malaysian Grand Prix will be fascinating. Heavy rain is expected during the course of the race and with no traction control, driving these powerful single-seaters in tricky conditions will certainly test the drivers’ skills to the extreme! Lewis Hamilton took a commanding victory in Albert Park with a perfect lights-to-flag drive in a race filled with dramatic incidents and several safety car periods behind the victorious McLaren. Hamilton kept his composure as the others were crashing, spinning or breaking down with mechanical problems! 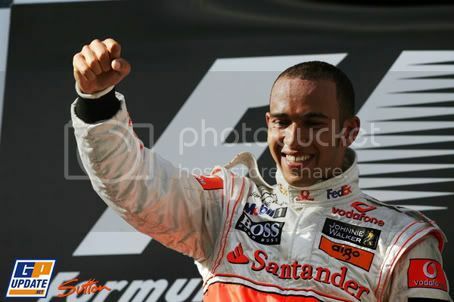 It was Hamilton’s fifth Grand Prix-career win and the ideal start to his championship campaign. Main rival and pre-season favourite Kimi Raikkonen failed to score after an eventful race fighting through the mid-field. BMW Sauber’s Nick Heidfeld finished in second with Williams’ Nico Rosberg completing the podium. Both Ferraris retired with mechanical problems after a series of driving errors by drivers Raikkonen and Felipe Massa. McLaren were set for a perfect one-two finish, but Hamilton’s new team-mate Heikki Kovalainen suffered a misfortune of the late safety car period (which resulted him to the tail end of the grid after making his final pit-stop) and accidently hitting the pit-lane speed limited after passing ex-McLaren driver Fernando Alonso in the final laps in this dramatic Australian Grand Prix! The race was chaotic from the start. On the opening lap in this post-traction control era, the 2008 Formula One World Championship started off with a bang with Ferrari’s Felipe Massa losing control exiting turn 1 and crashing into the tyre wall (breaking his front wing) in a bid to out-accelerate Heikki Kovalainen’s McLaren. Behind the spinning red car, a five-car collision involving Sebastian Vettel (Toro Rosso), Giancarlo Fisichella (Force India), Mark Webber (Red Bull), Anthony Davidson (Super Aguri) and Jenson Button (Honda) resulted in the first call of the safety car. During this chaotic moment Ferrari’s Raikkonen took the advantage to leap from P15 to eighth in one single lap, but he would remain trapped behind seventh-placed Rubens Barrichello’s Honda for the first 18 laps of the race. After the restart, Lewis Hamilton easily kept his lead from Robert Kubica and it was clear that the BMW did not have the pace to keep up with the McLaren. By the eighth lap, the leading McLaren was 4.3 seconds ahead and the following lap Lewis pulled another 1.3 seconds clear… Running on the lightest fuel load compared to the top runners on the grid, Kubica headed to the pits on lap 16 and dropped further behind the race leader. Race leader Hamilton made his first pit stop on lap 18 while his team-mate Kovalainen stayed out until lap 23. Before the Finn made his pit-stop, Raikkonen managed to recover from his low grid position and was now up with the leaders. It was at this point, that the sister Ferrari of Felipe Massa caused the second safety car when the Brazilian tried an ambitions move down the inside of David Coulthard’s Red Bull at turn 1 on lap 25. The two cars touched and Coulthard was sent flying in the air, only to crashed back down spreading debris across turns 1 and 2. Massa retired when his engine cut out shortly afterwards. At the second restart Raikkonen – who was decided not to pit for fuel and some fresh Bridgestone tyres – immediately pounced on Kovalainen. But in a bid to pass his fellow Finn, the Ferrari driver braked too late for turn three and went off! Kimi managed to avoid hitting the wall and crept back onto the circuit. But by then, he dropped down to eleventh behind the leading McLarens, Heidfeld, Rosberg, Barrichello, Sebastien Bourdais (who was driving superb and benefitted from a single pit-stop in the first safety car), Kubica, Fernando Alonso, Kazuki Nakajima and Timo Glock. Raikkonen quickly caught Glock’s Toyota but made his second mistake at his ‘favourite’ corner on the Albert Park circuit. Yes, at turn 3… The world champion put his left wheels on the grass at the entry to the corner and the car got away from him. Luckily the anti-stall preventing him from retiring on the spot and Kimi gathered it up and continued. Meanwhile up front, Lewis was proceeding to edge away from his team-mate Kovalainen, while Heidfeld and Rosberg – who switched places at the first rounds of pit-stop – was keeping up with the second McLaren. Heikki was running a longer middle stint compare to the others and this proved to be his undoing, as the safety car made its third appearance on the day. On lap 45, Toyota’s Timo Glock ran wide exiting the fast turn 12 and launched his car destructively over an access road, hurling debris over the track. Glock was tremendously lucky not to have been pointing towards the barrier when he hit the bump or he would have had even more violent impact… The safety car was out once again. The need to wait for the pit lane to open under the caution (yellow) period meant Kovalainen fell to the back end of the pack, while team-mate Hamilton was able to return to the front of the queue with Heidfeld, Rosberg and Bourdais close behind. Unfortunately, Honda’s Rubens Barrichello refused to wait for the pits to open and made his stop. This resulted in one of the worst pit-stops of 2008. First, he broke the rules entering the pits despite being closed (earned himself a time penalty). Then he managed to knock down his Honda mechanics over as he pulled away with the fuel hose still attached… And to top it off, Rubens exited the pit lane while the red light was on! All this from the most experienced Grand Prix driver and it was no surprise that he was later disqualified from the result despite finishing in sixth. As the safety car peeled in at the end of lap 49, an over-eager Kazuki Nakajima (Williams) crashed into the back of Kubica. That ended the Polish driver’s race but the Japanese was able to continue after pitting for a new nose. The race stewards were unimpressed, however, and handed Nakajima a ten-place grid penalty for next weekend’s Malaysian Grand Prix. Kimi Raikkonen would have finished with this pair had his car not suffered a late failure. The Finn scored no points despite being marked out as the race favourite by fans and pundits. Lewis Hamilton had begun the race with one of his old karting rivals alongside him – Robert Kubica – and ended it on the podium with another – Nico Rosberg. This was the German’s first podium after 35 races racing in Formula One. Nick Heidfeld continued his impressive race performance with second for BMW while Nakajima backed up his team-mate Rosberg with sixth, placing the Williams team in second position in the constructors’ standings. Such was the high attrition rate in Sunday’s Australian Grand Prix that only six cars made the finish, both Bourdais and Raikkonen were classified seventh and eighth respectively despite not making it to the chequered flag. “The team did a fantastic job as always, and the car was phenomenal, a complete dream to drive compared to last year. Indeed, the first race of the new Formula One was certainly entertaining. Let’s hope the following race next weekend at Sepang will provide more drama and excitement! NEXT ROUND: Malaysian Grand Prix, Sepang. March 23. McLaren star Lewis Hamilton will start the first race of 2008 from pole position after an exciting qualifying session at Albert Park. BMW’s Robert Kubica joins him on the front row while the Ferraris of Felipe Massa and race favourite Kimi Raikkonen will start from fourth and sixteenth respectively. As for Fernando Alonso, the Renault driver missed out the top-ten shootout and will start the Australian Grand Prix in P11. Hamilton is in prime spot to take his first victory of the year and thanks to his main championship contenders down in mid-field, the British ace has the advantage to start his title campaign in the best possible way. But BMW could spoil McLaren’s party thanks to an excellent qualifying performance from Kubica. In fact, if the Polish driver didn’t lose the momentum exiting the fast left-right chicane, Robert could have grabbed pole… Still P2 on the starting grid is mighty impressive and a chance for race glory looks likely. This set back for the Iceman was a major disappointment for the team, as Kimi was the favourite to take pole position and the race victory. By starting from P16, it will be a challenging Grand Prix to fight his way back into the top eight point-scoring positions, but it will be great for us to see this! BMW’s Nick Heidfeld lines up on the third row of the grid with fifth, ahead of Toyota qualifying specialist Jarno Trulli. Nico Rosberg is in seventh position for Williams with Red Bull’s David Coulthard in eighth. And rounding out the top ten is Honda’s Ruben Barrichello with Sebastian Vettel in the Toro Rosso. In fact, Vettel made it through to the final qualifying session after setting the sixth fastest time in Q2 but suffered a similar problem to Raikkonen and didn’t set a time. Sunday’s Grand Prix at Melbourne will be fascinating, as the drivers will be racing without traction control. It should give us more racing action and hopefully overtaking. In addition, the duel to the first corner between old karting rivals Hamilton and Kubica could be dramatic as both don’t want to give way! I will be following the new drivers making their Formula One debuts closely in particular four-times Champ Car champion Sebastien Bourdais (who starts in P17) and Nelson Piquet (who seems to be struggling after qualifying P21). I want to see if these F1 rookies can handle the pressure of racing these extreme single-seaters during a full Grand Prix distance. The first race is also a good indication on which driver and team package looks strong in the new racing season and going by past results, the winner of the opening race goes on to take the title. For Lewis Hamilton, this year could be his and by starting in front of everyone else, the Brit has the best chance of winning in style with a great race victory in Melbourne. So fingers cross if he takes the chequered flag after 58 laps around Albert Park! • Timo Glock has been demoted ten places on the starting grid. Five positions by changing his gearbox, then a further five for blocking during qualifying. It’s that time of year again, a new Formula One season is upon us and with new drivers joining new teams – this year’s world championship could be the most dramatic and unpredictable in the 57 years of the sport. With the spygate controversy and messy politics left thankfully behind, it’s a good opportunity to look ahead to what this year’s championship has in store. Ferrari and Kimi Raikkonen will be determined to keep their title honours after winning last year’s championship against the highly competitive McLarens. The season long battle with double world champion Fernando Alonso, rising star Lewis Hamilton and the ‘Iceman’ Raikkonen were the highlight of the racing season. It was a fascinating contest between these top quality drivers going for race victories last year and 2008 will provide even more spectacular action! 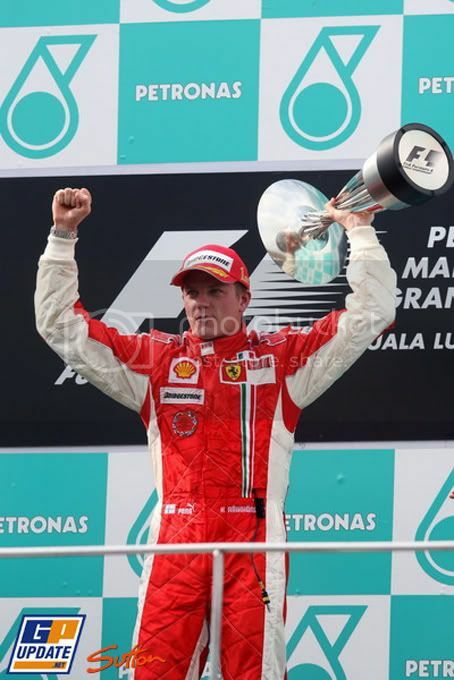 For Raikkonen, the Finn was ecstatic to finally win the drivers’ crown after several years of trying. Last season will be remembered for his sheer determination by driving flat out all the time! Despite struggling in the early part of 2007 with the new Ferrari… After the Finn has overcome his problems with the characteristics of the Bridgestone controlled tyres and the F2007, the Iceman was achieving some quite extraordinary results. To win the title in that gripping season finale in Sao Paulo was unbelievable. All odds were against him and yet the Finn focused on what was on hand and after two hours of some quality driving, he finally did it! Now the next challenge is to defend his title honours. Lewis Hamilton may have missed out on winning the drivers’ title in his first season of racing in Formula One, but he shouldn’t feel disappointed, as his performance at McLaren was nothing short of remarkable. In fact, he scored four impressive race wins and came within a grasp of winning the ultimate prize in the sport in his rookie season. This year will provide him a better opportunity as the British star has the experience of knowing all the tracks and his rivals. It is now down to McLaren in providing a race-winning car to challenge the Finn. And yet sadly, 2007 will always be remembered by the politics and the outrageous spy scandal that dominated the racing action. The main talking point was the espionage controversy involving Ferrari and McLaren, which led to McLaren being excluded from the constructors’ championship and fined a record $100 million for having obtained knowledge on Ferrari technical data… There is still a debate to this day whether or not the team are guilty. So that was a brief recap on last season’s championship. 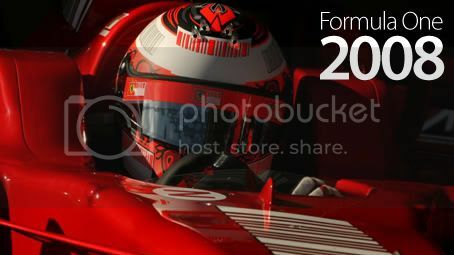 What can we expect to see in F1 2008? What are the new rules and regulations and who will come out on top? All this will be revealed in this in-depth preview to the 2008 FIA Formula One World Championship.